Every girl grows up dreaming about her wedding day, be it the grand decor, mouth-watering food, flawless makeup or lavish venues, but the most important of all is to flaunt herself in a perfect bridal trousseau just like a princess in a fairy tale. Since wedding is a one time life event, brides never compromise on their wedding outfits and approaches top fashion designers or multi-designer stores , wedding shopping malls and also spend lot of money without any hesitation.Bridal Lehenga is bride’s dream that come true outfit that they wear them on their wedding or reception. 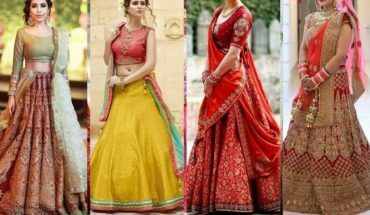 How to Reuse Bridal Lehengas After wedding?? 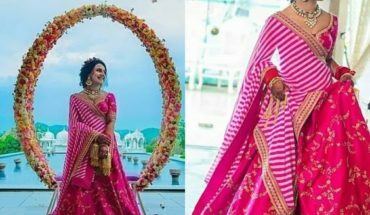 What to do with your Bridal Lehenga after Wedding ?? But What happens to your super-expensive bridal lehenga once the wedding is over?? Are they safely dry washed and stored in your wardrobe? 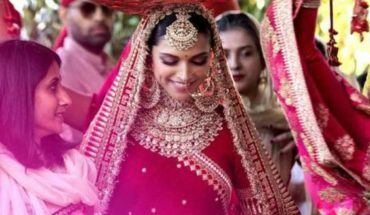 I am sure that you wear that lehenga hardly one or twice after your wedding. Well, that’s not good spending lot of money and storing them in a rack without using them. isn’t it?? Do you ever think of any other ways to wear that masterpiece? 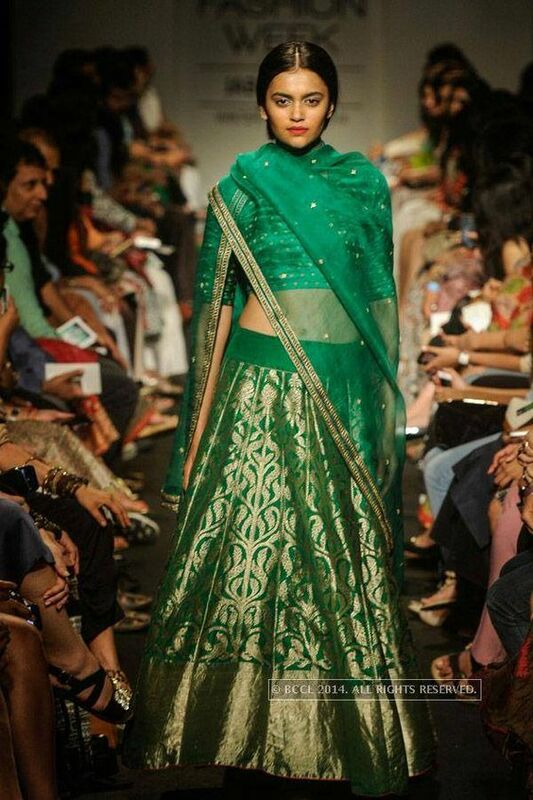 Here we come up with some interesting ideas to re-wear, re-use and re-cycle your bridal Lehengas. Yes..You read it Right!! Lets go through those ideas. You can go for any one of the following ways a dupatta can be draped in to make you look stunning and perfect and give away your bridal look. Popular South Indian style known as a half saree, This traditional look has the dupatta draped over your shoulder like a saree with the opposite corner tucked in the back. Everything is pinned and out of your way. 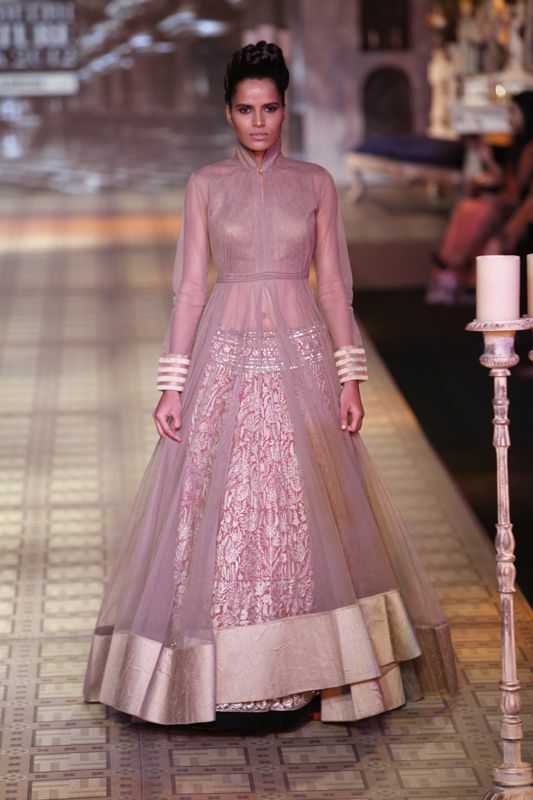 Take the longest end of your lehenga dupatta and bring it to the front. Fold the corner to create a pleat and then tuck it into the front of your skirt, just below your belly button. Make sure that you tuck in enough fabric to hold the dupatta in place. A few inches should do. Another casual and chick way to drape your dupatta for an everyday and effortless style is to drape it around your neck in v-shape or u-shape. The style works especially well on heavy Lehengas and printed or light designed dupatta that makes for an awesome style statement and keeps you warm in winters too. This elegant draping style, lets you flaunt your full attire and compliments your outfit. To follow this style, take your dupatta across both the shoulders and let the ends fall loose at the back. Allow your dupatta tilt a little down from the beauty bone to form a V-shape, and you are ready to flaunt perfectly among your peers. This Dupatta Drape cut downs the heaviness of your Lehenga. One of the easiest ways to drape the dupatta without any extra fuss is to just pleat the whole dupatta and drape it across one of the shoulders. There is no need to fidget it at all and the other end is cleanly tucked at the back. This drape works if your dupatta is not too heavy so that it covers up some of your Lehenga which is heavy embellished. Keeping the skirt and blouse as same and Replacing heavy dupatta that comes part of Bridal outfit with plain contrast colored dupatta also gives new look to your outfit. 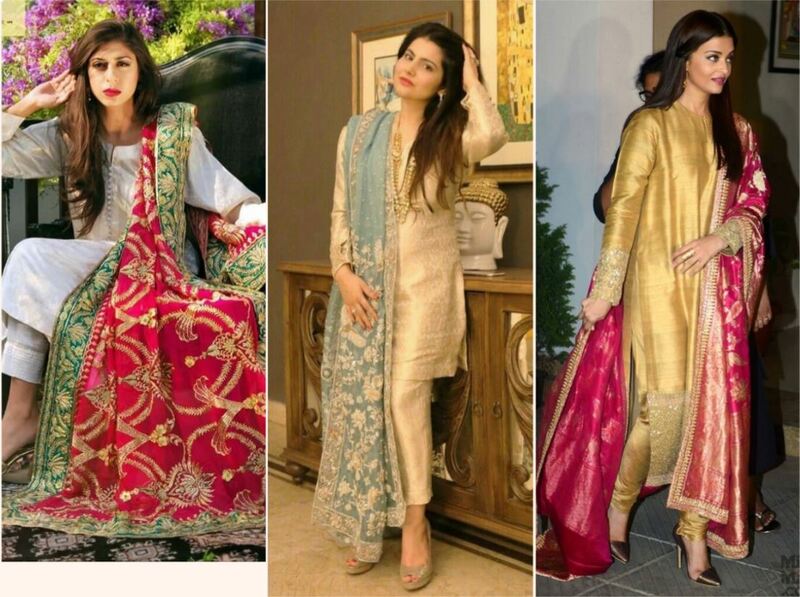 Plain dupatta cut downs extra glitters from your outfit. You can even try draping saree over your Lehenga but make sure saree should be plain with simple Khaddi border otherwise it looks so clumsy. You can wear the Lehenga as it is and replace Dupatta with Saree. You can use lehenga skirt as petticoat for any net saree that works very well with thin ladies. Usually, the bridal Lehenga comes with Heavy embellishes skirt, blouse and dupatta. So seperate them and re-use with other outfits. Reusing is the best option for whom they don’t want to alter or cut thier precious outfit. While you re-using your bridal Lehenga, you will not be disturbing or cutting any part of your outfit . It just looks as it is but you will change the appearance by mix-and-match your skirt, blouse & dupatta and team them up with different outfits to create a vivid contrast. The Blouse makes a huge difference, you can replace your heavy embellished blouse and bring a drastic change to your outfit. You can wear the skirt as it is and team it up with a plain and stable colored button-down shirt, peplum top or any plain monochrome top with no work and tuck your plain top into the lehenga which gives ultra modern look . It is easy to wear and can be wore to any function without looking odd. A Black or White colored top or full sleeves T-shirt does wonders with any kind of Bridal Lehenga. 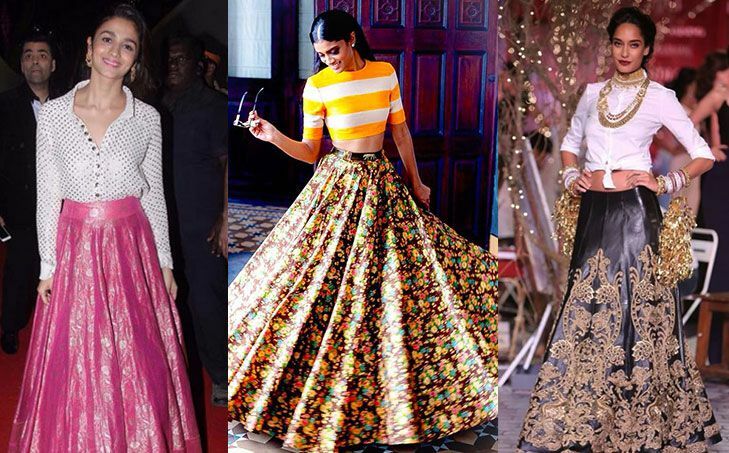 Its a bollywood trend currently running with heavy Banarasi Lehenga on plain shirt or top. Dont make both top and bottom heavy that ruins the entire look. You can accessorize your outfit with heavy Kundan necklace to exquisite look. Team up your Skirt with Plain and Long kurta with front slit or Plain Jacket that transforms the entire look and feel of your outfit. You can even go for simple embellishment at neck or at the sleeves with small butta over all kurta or Jacket. A Plain Georgette or Net kurta with small butta with out slit also gives stunning appearance when the heavy embellishment of skirt is seen through the semi-transparent fabric. Try experimenting with contrast colors. Usually, the dupatta comes with bridal lehenga will be heavy. Team them up with any plain and simple apparel such as plain anarkalis, plain Long Gowns or any plain skirt that bring up extra attraction to your outfit also it gives rich and heavy look to your simple apparel. you can use dupatta as Voni in case you are going with Half saree. You can also reuse the blouse with other sarees. As the wedding blouse would be fully embroidered, you can always use them with a plainer and simpler saree to balance out the look. This gives you a very rich and chic look. Check out these pictures to get an idea of reusing the lehenga blouse with sarees. Try wearing a cape over your choli, it is the trendiest style, which is buzzing in the fashion circuit. When it comes to Recycling, you will be cutting your Bridal lehenga and use them intelligently, you can use all of that fantastic fabric to create many more fabulous outfits. But what you need is a experience tailor who can turn your outfit as per your need. Usually, the bridal lehenga skirts are attaches underneath the skirt to look voluminous. you can detach those can-can from the skirt to cut down the volume to it looks like normal lehenga and ready to wear to any occasion. You can transform your bridal lehenga to a beautiful anarkali that never goes out of fashion and will get lot of compliments for sure. Attach the blouse to lehenga skirt if it is lengthy enough and decorate with fancy lace to the waistline to look great. 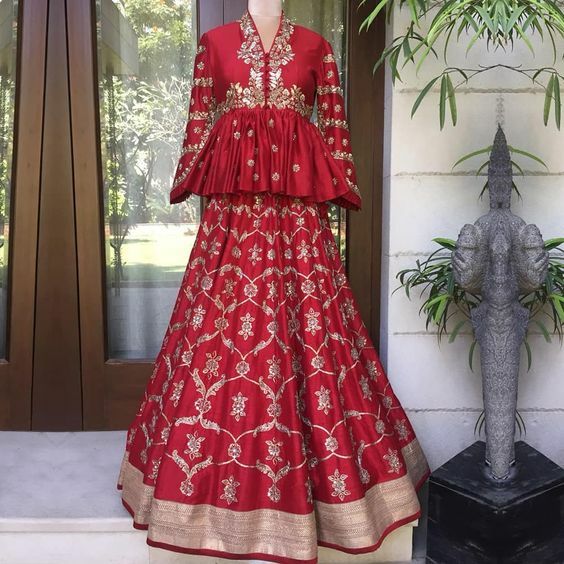 If the choli length is not enough you can take matching fabric in contrast color and attach to the yoke part of the anarkali and embellish the neck and sleeve ends to grab the attraction . If Kalis are more in the bridal lehenga then remove excess kalis while converting Anarkali to keep it fit and no one even recognize that it was made from your bridal lehenga. Yes .. You heard it correctly. Not only Sarees are converted to Lehengas, but also vice versa. Lehenga sarees also soo famous now a days. Open up your lehenga skirt and attach some plain cloth to saree start tucking part and Heavy embroidery dupatta to the saree pallu. If you dont want to disturb the lehenga skirt then Attach the lehenga Dupatta with any Plain or Net Saree with some lace. you can see the elegant designed saree by yourself and It looks even great if you go for contrast dupatta and Skirt has more Kalis. that’s it you are ready to rock the show.. The Layered Lehenga styles are one style which gives a very designer and stylish look. 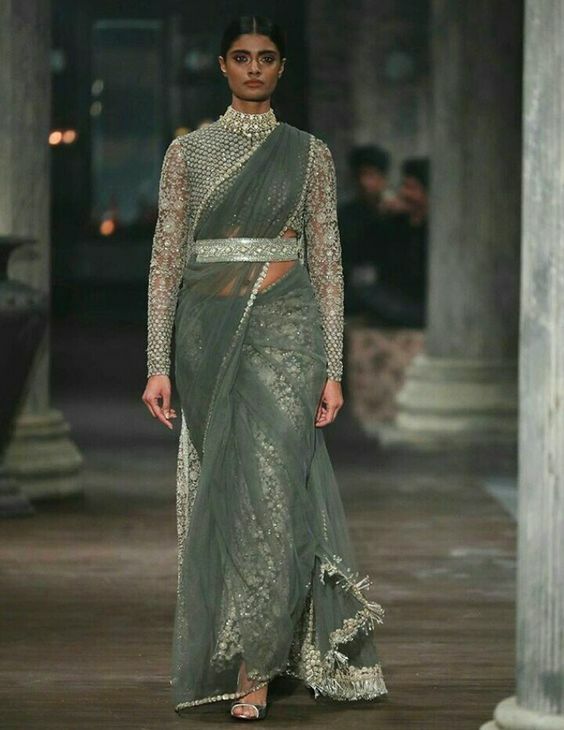 A Layered Lehenga, as the name suggests, has several layers of materials on the skirt, forming flares of different sizes from top to bottom of the skirt It has high-low hemline with same fabrics or different fabrics being seen from the uneven hemlines layered over one another. These Layered Lehengas not only gives attraction they can dim down the shimmery part of skirt as well. If you have heavy embellished or shimmery part in your skirt that you want to convert it up then just layer it up on top of skirt with sheer fabric , Georgette or any transparent fabric with Lace or border attached to that layer.You can even try slit for the top layer. If you have colorful and heavy embellished lehenga dupatta, then you can stitch it into a brand new heavy work kurti, which you can wear at evening parties and functions. Not only Dupatta you can ask your tailor to convert your lehega Skirt to stunning kurti or Long Jacket with fashioned Neckline . No doubt all your friends and relative inquire about your outfit. 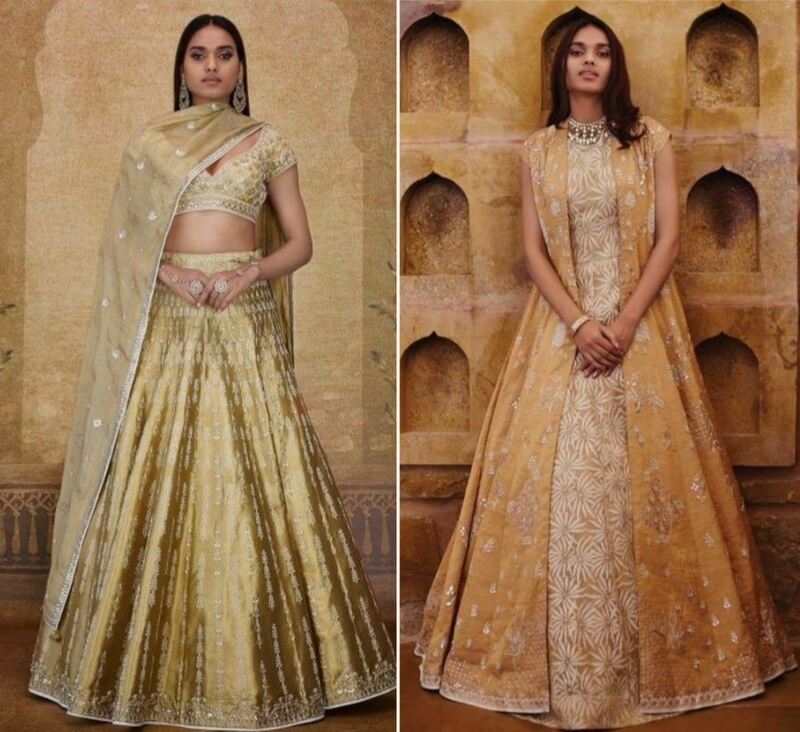 We can think of these Revamping Bridal Lehenga Ideas .. Share us your thoughts if you can think of more. 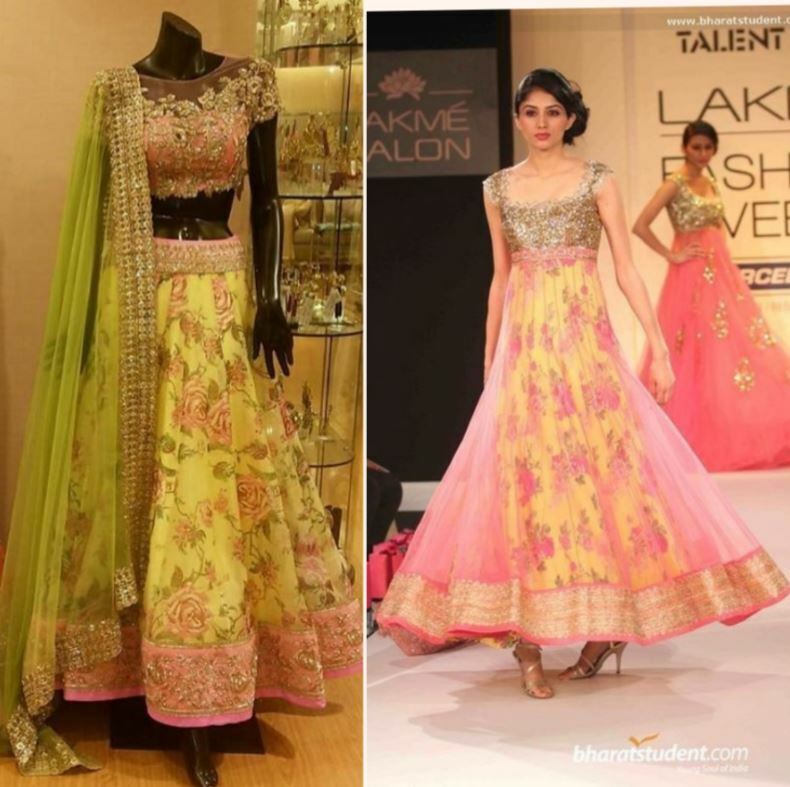 Try these Reuse Lehenga ideas and share us your opinion in below comments section.